and was headed by Ludwig Prandtl (1875-1953) from the beginning in 1907 until the end of the II. World War. see also English reference in Wikipedia. Former member of the DLR Institute of Aeroelasticity in Göttingen. Picture to the right taken by my colleague Thomas Büte on the occasion of my final lecture and farewell party at the DLR_School_Lab on October 20th, 2009 - my 65. birthday (hr). Born in 1944. Theoretical physicist. Physics diploma in 1972 on Homogeneous Solutions of Einstein's Field Equations at the University of Hamburg. Teaching qualification for Physics and Mathematics in 1973 ("Höheres Lehramt"). PhD Hamburg 1976 in Astrophysics on the Numerical Integration of the Hydrodynamic Equations for Gravitating Gaseous Spheres. 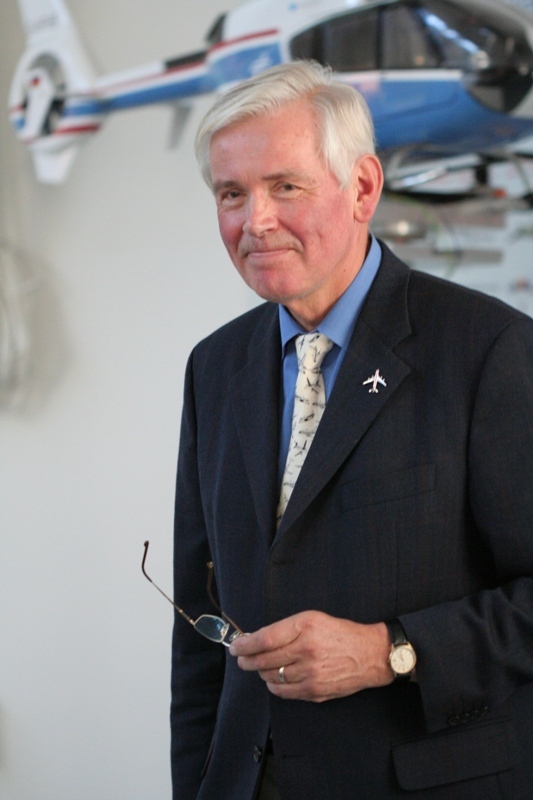 He joined the DLR Institute of Aeroelasticity in 1976, working in the fields of rotor aerodynamics (1976 - 1985), unsteady aerodynamics and aeroelasticity. Among others, activities concentrated on fluid/structure interaction for transport aircraft wings within the joint DLR and Airbus aircraft industry project ADIF. 1985 - 2003 cooperation with the group Biophysics of Animal Flight (Zoological Institute of the University of Göttingen) and lectures on Aerodynamics of Animal Flight. From 2003 to 2006 participating in two projects, the European project AWIATOR (initial EU press release ), subsequent Infopage TU-Berlin), Task 3.3 in cooperation with Airbus Deutschland, and the DLR project HighPerFLEX. In 2007 a new DLR research programme iGREEN was launched, which is based on a generic airplane configuration and deals, among other goals, with the influence of wings on each other. Retired October 31st, 2009. From 2009 to 2011 development of the artificial bird SmartBird within the framework Festo Bionic Learning Network. Presentation of SmartBird on the occasion of the Hannovermesse 2011. From 2011 to 2014 research and development of the DualWingGenerator in cooperation with the Festo AG. Presentation of the outcome at the Hannovermesse 2014. At present designing and making of wind tunnels and measuring devices for scientific and educational purposes. Membership: Deutsche Physikalische Gesellschaft e.V. (DPG German Physical Society) ¤ Deutsche Gesellschaft für Luft- und Raumfahrt e.V. (DGLR German Society of Aeronautics and Astronautics) ¤ Science on Stage Deutschand e.V. (SonSD) ¤ Göttinger Experimentallabor für junge Leute e.V. (XLAB Experimental Laboratory for Young People) - In 2017 the society ceased to exist, and XLAB turned into an educational institution of the University of Goettingen. ¤ American Association for the Advancement of Science (AAAS) until 2015 - [e.V. refers to the legal form which means incorporated society]. Formerly a private - meanwhile a full-time - scientific interest in the mechanisms of flapping flight, particularly in the physics of animal flight. 1985-2003 cooperation with zoologists at the University of Goettingen . Lectures on the Aerodynamics of Animal Flight since 1988 (see below). Owner of a small company ANIPROP GbR, which manufactures - among others - the two animal flight models shown below for museums, laboratories and science centres. 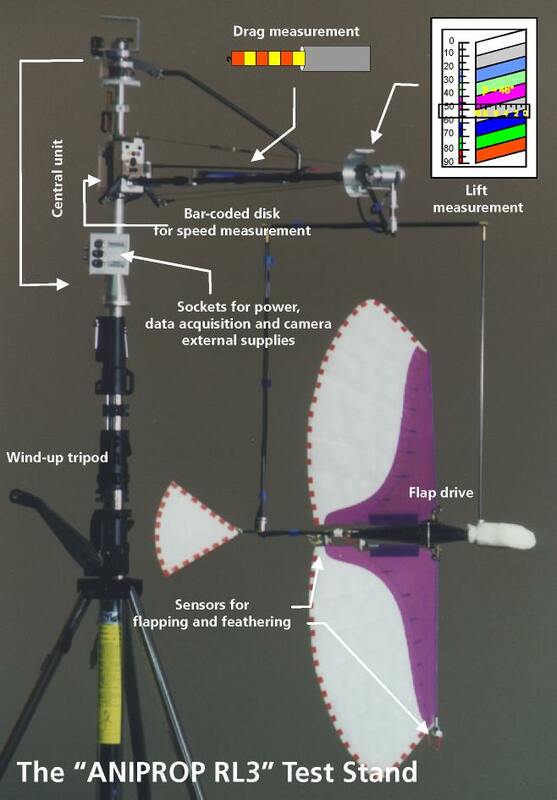 In 2011, the making of SmartBird verified his theoretical concept of active torsion for efficient flapping flight. The DLR provides an electronic library catalogue. Please, visit "ELIB" with "W. Send" as keyword. A new system is in operation since November 1st, 2005, in which some of the publications (earlier than 1995) obviously got lost. Since 2018 the Google Scholar profile Wolfgang Send is authorized. W. Send, An Approach to the Gust Problem with Interfering Profiles, in: New Results in Numerical and Experimental Fluid Mechanics VII, Springer-Verlag Berlin Heidelberg 2010. W. Send, An approach to the gust problem with interfering profiles, International Forum on Aeroelasticity and Structural Dynamics (IFASD), Seattle (U.S.A.), June 21-25 2009: IFASD-2009-109_Send.pdf (0.9 MByte). Published in: Notes on Numerical Fluid Mechanics and Multidisciplinary Design, Springer Verlag 2010, ISBN 978-3-642-14242-0. Abstract. 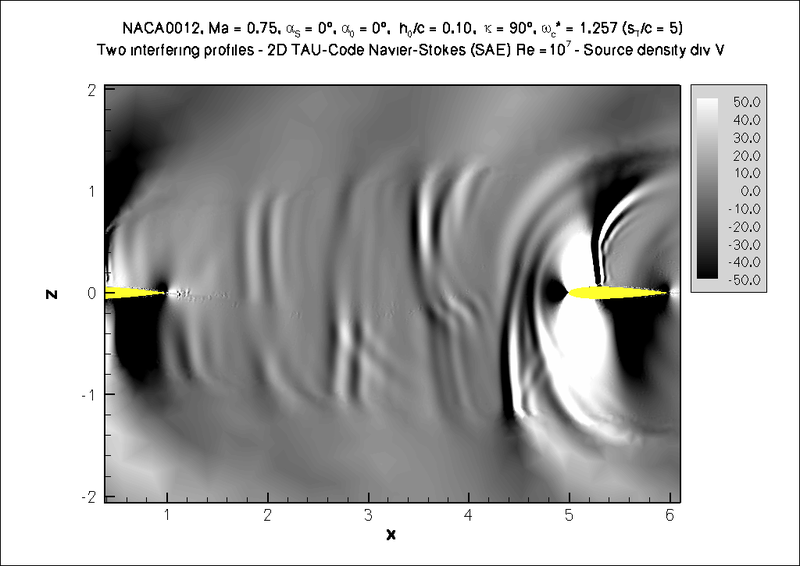 The mutual influence of two profiles is studied in subsonic and transonic 2D viscous flow. The profiles are arranged such that the second one is located downstream of the first one similar to the configuration of a tail plane behind a wing. The study prepares for several wind tunnel experiments in the DLR’s 1x1 square meter transonic wind tunnel. The physical effect is that of a gust generator: The unsteady wake of the leading profile encounters the trailing profile and effects a load change. A first simplified attempt has been made using a rigid grid where both profiles execute a synchronous heaving motion. This simplification avoids additional numerical implications caused by the chimera grid generation technique, which needs to be applied for profiles being in motion relative to each other. After the motion is turned off, the vorticity shed from the leading profile carries a single gust event downstream to the second profile. The Fourier analysis of the load history shows the load spectrum. Besides the main purpose of the computations to predict gust loads, the unsteady flow field with the physical data given below shows interesting features like the interaction of two wakes, the generation and propagation of sound waves and the impact of incoming vorticity on a shock front, where almost all of the supersonic domain literally is blown out. Abstract. 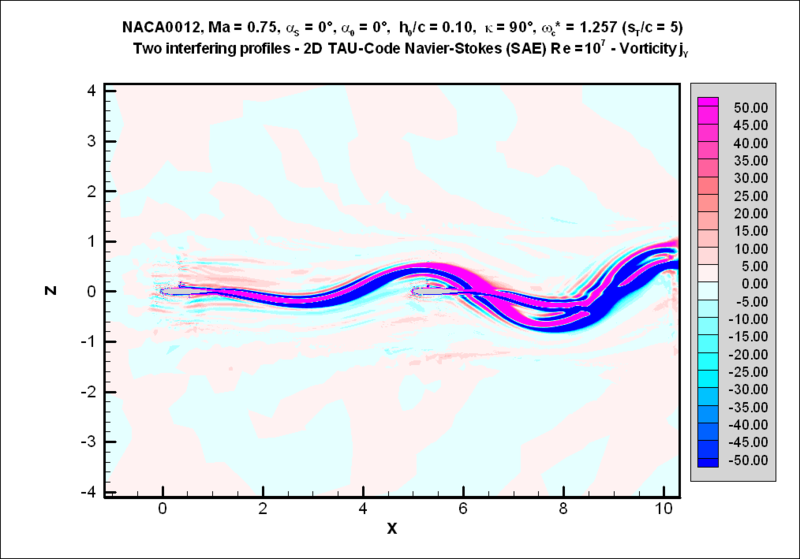 The mutual influence of two profiles is studied in subsonic and transonic 2D viscous flow. The profiles are arranged such that the second one is located downstream of the first one similar to the configuration of a tail plane behind a wing. The physical effect is that of a gust generator. The unsteady wake of the leading profile encounters the trailing profile and effects a load change. A first simplified attempt has been made using a rigid grid where both profiles execute a synchronous heaving motion. The Fourier analysis of the load history shows the load spectrum. The accuracy of the computation is investigated using inherent physical properties. W. Send, Flapping-Wing Thrust in Compressible Flow, 25th International Congress of Aeronautical Sciences (ICAS), Hamburg (Germany), September 3-8, 2006: icas06_send_paper_3.10.4.pdf (1.4 MByte). Abstract. The phenomenon of thrust generation by a coupled bending and torsional motion is surveyed ranging from incompressible flow to the transonic region. 2D wing sections and 3D planforms are studied. The paper also touches on the question, whether flapping-wing thrust for larger airplanes is physically possible. W. Send, Harmonische Flatteranalyse im Zeitbereich (Harmonic Flutter Analysis Integrated in Time), German Aerospace Congress, Munich, November 17-20, 2003: dglr_2003_120_send.pdf (870 kByte). English/German website related to this paper. Content: The paper introduces into the flutter phenomenon from a practical point of view. After an explanation of the basic equations at the beginning, the FE model of a simple wing model, a flate plate clamped at one side, is the focus of the work. All elastomechanic and aerodynamic properties are referenced in various data files, which may be dowloaded. The paper demonstrates that a flutter analysis in the time domain leads to the same results like an analysis in the frequency domain, except the time integration can easily be extended to nonlinear phenomena. The time integration is a two-step procedure, in which "strong coupling" among any two degrees of freedom is searched for. The website offers the source code of a Fortran program FLT2DQ, which is based on IMSL subroutines. FLT2DQ is a general purpose program allowing for all kinds of coupling phenomena.In case of the presence of aerodynamic forces, they may be provided either as data in the input file, or they may be introduced applying the in-line subroutines for the well-known unsteady aerodynamic coefficients of the 2D flate plate by Küssner and Theodorsen (about 1936). W. Send, R. Voß, Stability Analysis in the Time-Domain Applied to Adaptive Transport-Aircraft Wings, 23rd International Congress of Aeronautical Sciences (ICAS), Toronto (Canada), September 8-13, 2002: icas2002_412.pdf (2.3 MByte). Abstract: A procedure for coupling fluid and structure is described, in which the structure is given by a Finite Elements model, and the fluid is computed with a flow solver for compressible flow. The tool is applied to the wing model of a modern transport aircraft, which is equipped with a small contour modification on the upper surface for drag reduction in the shock region. The aeroelastic stability is investigated in comparison to the original contour shape. Particular emphasis is laid on a proper mapping of the flow quantities into the structure and vice versa. W. Send, Der Traum vom Fliegen (Dreaming about Flying), Naturwissenschaftliche Rundschau 2/2003, 76-73). The paper is not available on the web. The reader is kindly referred to the journal. At the beginning, the article substantiates the fact that human beings are 'not made for flying' with flapping wings. Can the gap be closed between the maximum power output, which the world's best trained athlets are capable of, and the mininum mechanical power input required for a human flapper? Based on some rational estimates (Microsoft Excel data sheet including the famous 2D analytical solutions for the plunging and pitching plate by H.G. Küssner, 1936, and Th. Theodorsen, 1935) the answer is, for the time being: 'Well, it might work'. The article emphasizes the urgent need of progress in the techniques of coupling fluid and structure for large amplitudes in viscous flow for a final answer. The author keeps on dreaming: "Advanced Adaptive Airplane Technologies A³T" (500 kByte) shows one of the author's earliest initiatives to promote the study of flapping flight within the German aeronautical scientific community by emphasizing the potential technical spin-offs for drag reduction and enhanced wake decay. W. Send, Physik des Fliegens (The Physics of Flying), Physikalische Blaetter 6/2001, 51-58 (since 2002 renamed to Physik Journal). Among others, the article pursues educational goals, and promotes the teaching of the Physics of Flying in junior courses at universities as well as in senior classes at the German high schools (see also the annual course Physics of Flying given at the XLAB International Science Camp). The subject is treated on a broad basis, reaching from our present knowledge of animal thrust production to perceiving the vortex structures behind lifting surfaces with modern flow-analysis tools (like particle image velocimetry PIV). A prominent contention is raised once again: Where does the lift come from? Based on Ludwig Prandtl's concept of what the author names the infinitely thin boundary layer, the roles of Bernoulli's equation and of the boundary condition for the flow are clarified with respect to the computation of lift and drag. Data sheets and formulas for the examples given in the paper may be found in the internet pages, which accompany the publication. W. Send, Coupling of Fluid and Structure for Transport Aircraft Wings, International Forum on Aeroelasticity and Structural Dynamics, Williamsburg, Virginia (USA), June 22-25, 1999: ceas-aiaa_va99.pdf (670 kByte). This paper focusses on the data exchange between the two meshes on one and the same wing surface: the CFD mesh for the fluid and the FE mesh for the structural analysis (ANSYS FE model). A mathematical procedure is developed which accomplishes the mappings in both directions by means of a documented 2D B-spline algorithm (subroutines taken from the IMSL)and an iterative solution for the respective locations of the nodes. Explanation: The figure shows a converged solution (the structural side) in steady flow for a windtunnel model in a former French/German project named the Aeroelastic Model Program (AMP). The figure relates to the pressure distribution (the aerodynamic side) obtained from the same computation (not shown here). The odd torsion spring pursues a scientific goal. Its purpose is to reduce the - normally much higher - torsional stiffness to a first torsion mode with a natural frequency slightly above the first bending mode. 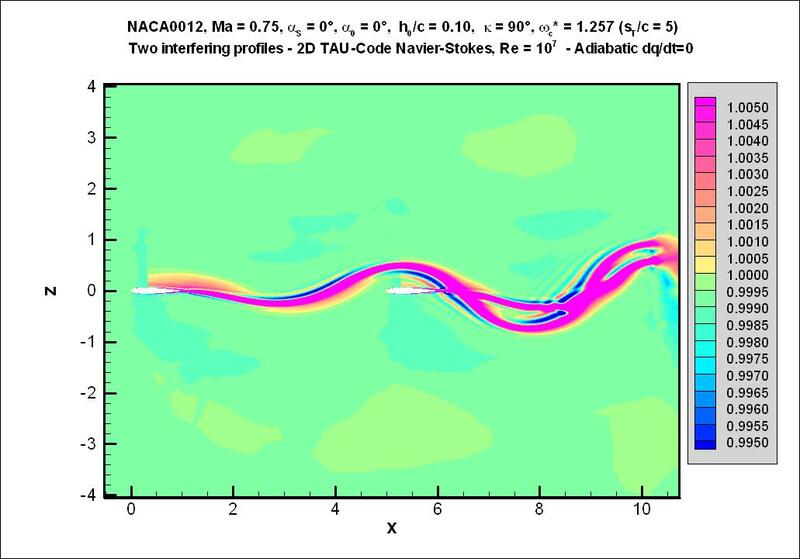 Thereby the configuration yields a flutter case slightly above that Mach number Ma = 0.82. For more details, please, see the paper. W. Send, Subsidiäre Schuberzeugung mit gekoppelten Biege- und Torsionsschwingungen in transsonischer Strömung (Subsidiary thrust production with coupled bending and torsional motion in transonic flow), Deutscher Luft- und Raumfahrtkongress 1999, Berlin 27.-30. September 1999: dglr_jt99_086.pdf (530 kByte). The paper gives an introduction into the basic mechanisms of coupled bending and torsional motion. The reader is invited to study the from scratch derivation of the basic formulas for thrust production and its location on the wing surface. A tentative estimate is made of the benefits applying the mechanism of subsidiary thrust production to a modern transport aircraft. The paper given 1996 at the anual congress of the German Society of Aeronautics and Astronautics (DGLR) on the occasion of the 100. anniversary of Otto Lilienthal's death addresses the early development of flapping flight. W. Send, Otto Lilienthal und der Mechanismus des Schwingenflugs (Otto Lilienthal and the mechanism of flapping flight), Deutscher Luft- und Raumfahrtkongress 1996, Dresden 24.-27. September 1996: dglr_jt96_030_send.pdf (3.6 MByte). W. Send, R. Voß, W. Wegner, Das aeroelastische System "Flügel mit Triebwerken" als Funktion der aerodynamischen Modellbildung (The aeroelastic system "wing with engines" as a function of the aerodynamic modeling), Deutscher Luft- und Raumfahrtkongress 1994, Erlangen 4.-7. Oktober1994: send_dglr94.pdf (630 kByte). The paper deals with the process of modeling the 3D unsteady kinematics entering an aerodynamic calculation in the frequency domain. It is shown that proper kinematics yields surprisingly good results also for unsteady airloads obtained from the 2D thin plate approximation being corrected for the Mach number. The data are compared with transonic doublet lattice computations and an Euler solution. The corresponding equations for aeroelastic stability are derived. Within the DLR HighPerFLEX project (2004 - 2006), one work package refers to the effects of coupled bending and torsional motion (CBT) on drag reduction and wake decay, which are investigated by the author. The well known mechanism of thrust production in nature happens to occur also during flight tests of transport aircraft with marginal effects just while activating the exciters for flutter tests. The basic relationships were discussed in an earlier papger cited above ( dglr_jt99_086.pdf - 530 kByte). The investigation is planned to be accompanied by experiments to verify theoretical predictions of the CBT effects on a flexible structure and to develop appropriate actuators. A tip model with 1.5 m span is deformed by bending and torsional motion. The preliminary tests will take place in a rotary test stand similar the development ANIPROP RL3 depicted below. Unfortunately, the construction, which is almost completely designed, is currently protracted due to changes in the institute's management. The preceding drawings show some parts of the test stand. The excellent design work was done by the student Birk Wollenhaupt supervised by the DLR engineering office, site Göttingen. In 2007 a new DLR project named iGREEN was launched, which deals, among others, with the gust problem and the influence of wings on each other (like the main wing on the horizontal tail plane). The contour plots give an impression of a numerical study in the course of the research programme. Two synchronously heaving profiles affect each other by vorticity shed downstream and sound waves travelling upstream (see also the recent 2008 paper cited above). The picture gives an impression of the display model ANIPROP SM1, which is animated by an electric motor. The produced thrust is sufficient to climb up the slightly inclined glide strut. After reaching the end of the strut the model glides back to the start position. The first model built was sold to the Otto Lilienthal Museum in Anklam, Germany. The lasting commitment to animal flight led to the development of a unique test stand, which demonstrates and measures all basic phenomena of the Physics of Flying like lift, drag, animal propulsion and aeroelastic flutter of a wing. The RL3 acts like a carusel. 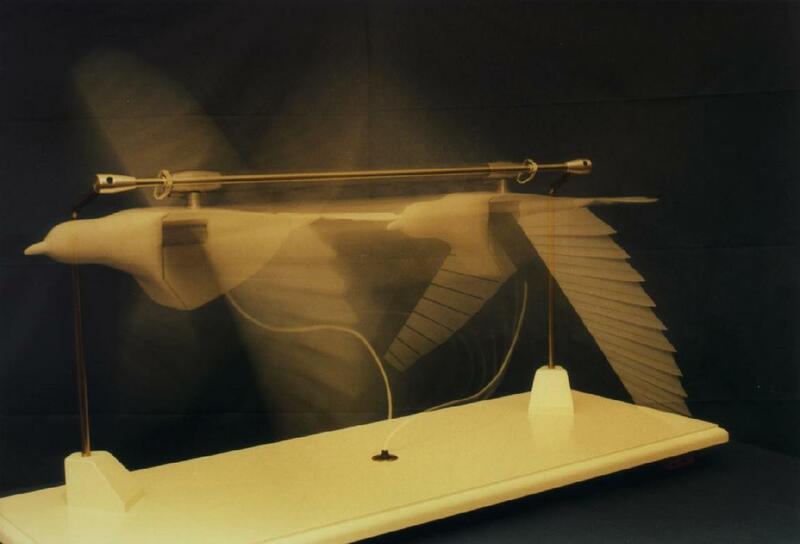 The artificial bird produces its own thrust to fly with a speed of about 3-4 m/s. The diameter of the circular course is 6 m. The picture below shows the test stand ANIPROP RL3, which has been manufactured by Send's partner in the company ANIPROP GbR until 2013 (see about us), Felix Scharstein. One copy of the test stand ANIPROP RL3 was acquired by the DLR for the DLR_School_Lab Initiative in Göttingen The laboratory is the DLR's contribution to the EXPO 2000 and beyond within the frame of a local science-related EXPO project in Göttingen.The description of Experiment #5 (340kByte) shows on page three the excited motion of a lifting surface above a specific speed limit, the phenomenon which is called flutter. The experimental lecture The Physics of Flying was selected by an international jury as one of the two German plenary lectures (named presentations) contributing to the Physics-on-Stage Festival in Geneve, November 2000 (see also the current activities following the initial event). 2002 we were invited to contribute to the event Highlights in Physics of the German Physical Society and other institutions . Since the winter term 2000/2001, a new experimental lecture Der Tierflug with the RL3 was held at the Zoological Institute of the University of Goettingen together with Wolfram Zarnack, Send's long-standing partner in the field of Experimental Biology. These activities terminated at the end of the winter term 2002/2003 due to Wolfram Zarnack's retirement in March 2003. Copies of the former lecture Aerodynamik des Tierflugs (Aerodynamics of Animal Flight) held since 1990/1991 are still available on demand. The experimental lecture Vom Vogelflug zum Düsenclipper (From Birdflight to Jetliners) was held for the first time as the annual "Public Lecture" of the GAMM conference 2000 in Göttingen on the occasion of the 125. anniversary of Ludwig Prandtl's birthday. The lecture resembles The Physics of Flying, but focusses more on nature's ingenious patent combining lift and thrust in one single device, the flapping wing. The lecture covers the basic physical phenomena in aeronautical sciences against the background of more the one century of human flight, which started with Otto Lilienthal's efforts in the period from 1891 to 1896 and turned into powered flight at the beginning of the 20. century. In 2003, we had the great opportunity to show the presentation as the "Public Lecture" of the annual congress of the German Aeronautical Society Deutsche Gesellschaft für Luft- und Raumfahrt e.V. Munich (programme Deutscher Luft- und Raumfahrtkongress 2003, 2.5 MByte). 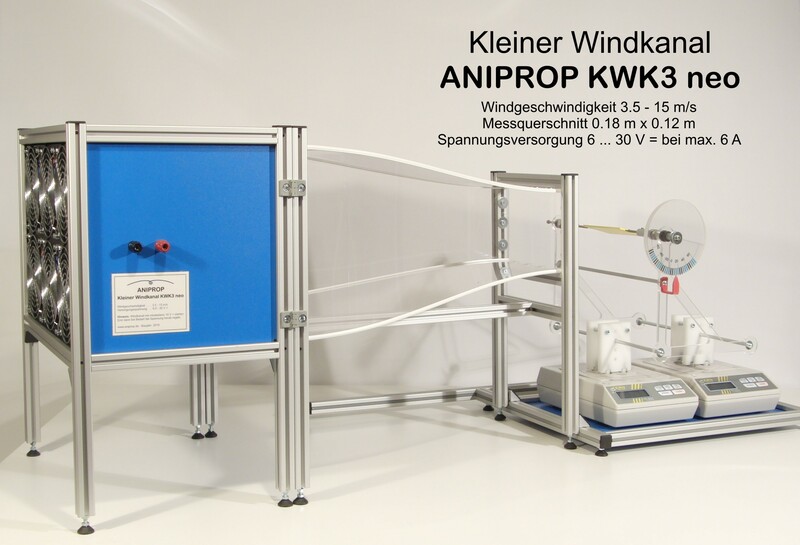 The most recent product of ANIPROP GbR is a medium-size wind tunnel named ANIPROP GWK3 (the link provides the offer in German). The wind tunnel was developed for teaching purposes and educational applications like undergraduate exercises in physics. 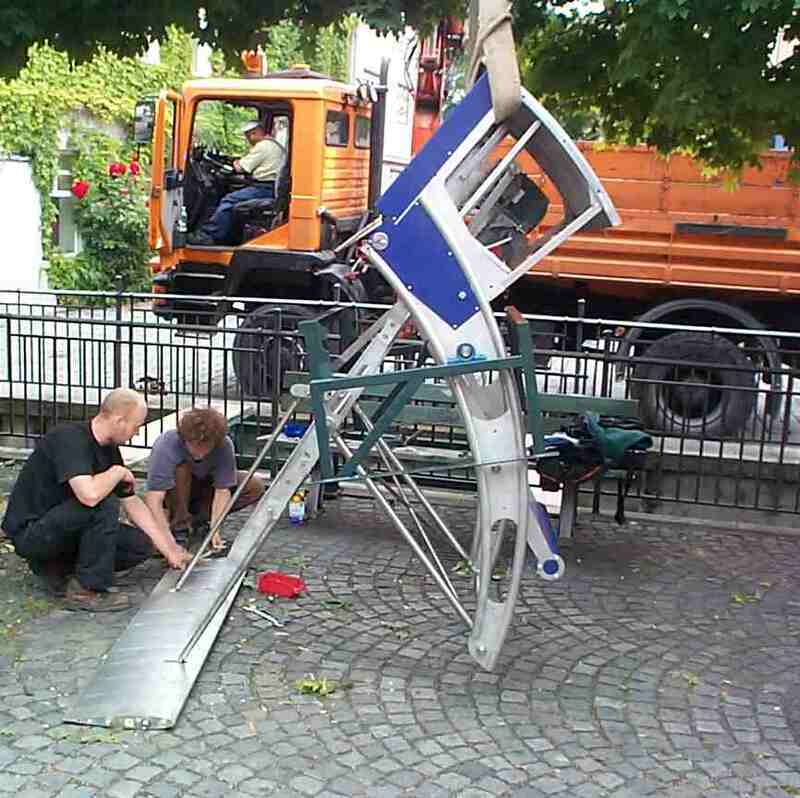 A new concept of the experimental lecture The Physics of Flying including SmartBird's performance (see below) presented in September 2014 as the public lecture on the occasion of the annual meeting of the German scientific society "Gesellschaft Deutscher Naturforscher und Ärzte e.V. ", which took place in the city of Mainz. Photos courtesy of Christina Hinzmann. 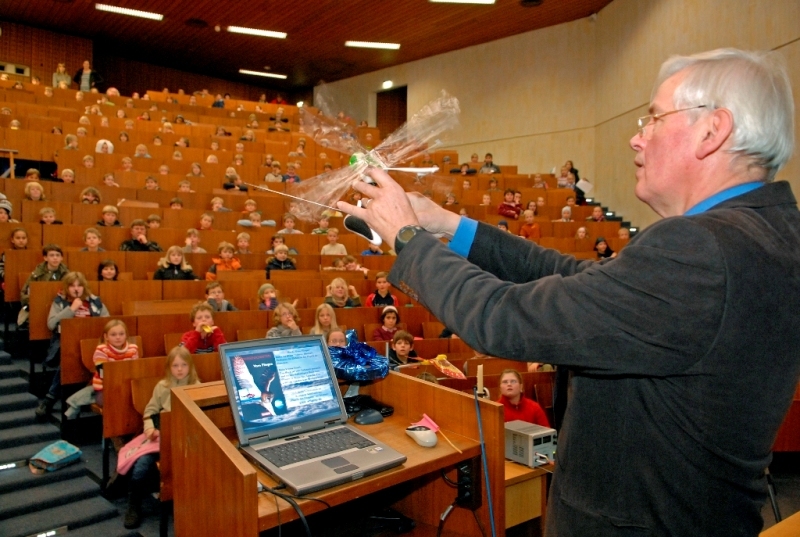 I love to teach young people the "Physics of Flying", and I am engaged in giving lectures and courses at the Children's University (page written in German) affiliated to the University of Göttingen. 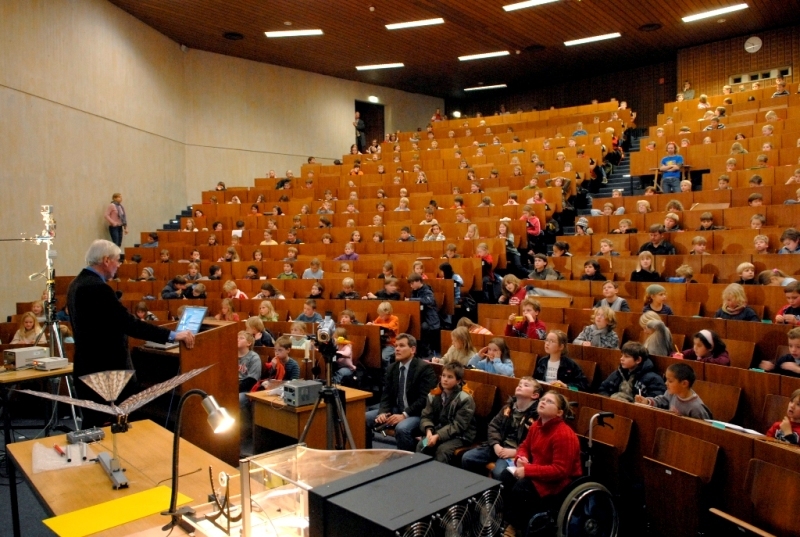 The lecture "We Make Wind" was proposed for the Science-on-Stage Festival 2008 in Berlin. It was held there as part of the lecture program, however due the given time schedule in a reduced version. The pictures were taken by Christina Hinzmann, a professional photographer at the Göttinger Tageblatt, on the occasion of the lecture "Wir machen Wind" (5.3 MByte) on December 3, 2008. In 2009 a new project was launched which was initiated and got full financial support by the Festo Company's Bionic Learning Network. The project was intended to have a closer look at the efficiency of animal flight. An artificial hinged-wing bird with active torsion and partially linear kinematics was developed. I was invited to develop the concept and take part as the scientific supervisor. Besides the scientific expertise ANPIROP GbR developed special tools in the course of the project for indepth research on the bird's components. The outcome was presented on the occasion of the international industry fair "Hannovermesse" 2011, April 4-8. More about the project may be found on Festo's SmartBird page. The project is documented in a short film "The Making of ...". A scientific publication was presented at the ICAS Congress 2012 in Brisbane (International Congress of the Aeronautical Sciences). An article in SCIENCE 23 March 2012 written by Dana Mackenzie gives some insight into the background of the SmartBird project. On June 23rd 2004, the stroke-wing engine (our English term for Hubflügelgenerator) ANIPROP HFG3 was launched in the city of Augsburg in Bavaria. 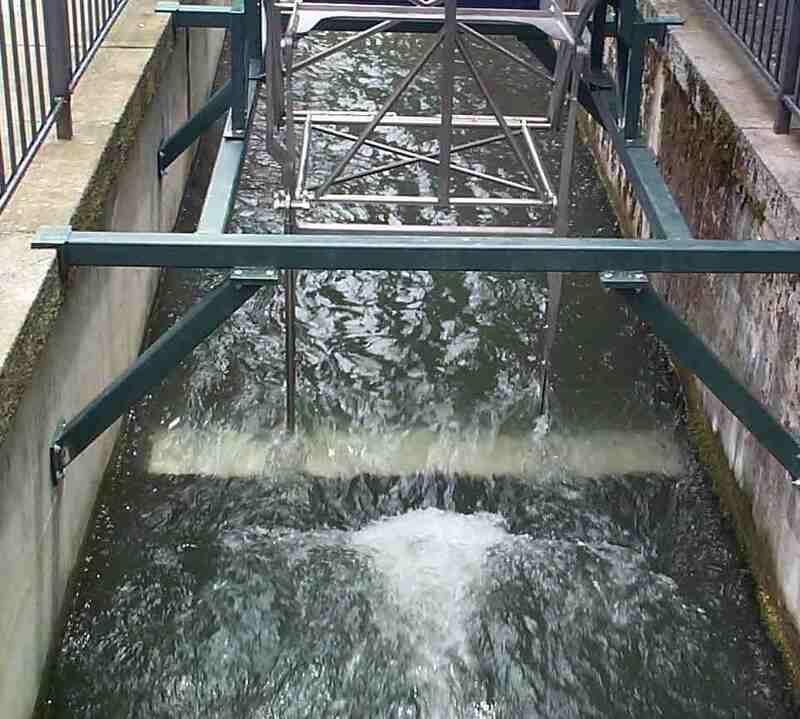 The technology demonstrator extracts energy from the small, fast flowing channel Mittlerer Lech bypassing the river Lech through the picturesque Old Town. The private development pursued the goal of gaining renewable energy directly from the kinetic energy in the flow. The basic physical concept rests on the well known aerodynamic properties of a coupled pitching and plunging motion, which also drives the mechanism of airplane flutter. However, the mechanism is substantially improved by introducing a "partially linear" motion instead of the common sinusoidal pitch and plunge, which meanwhile is patented. The tests were planned to last for two years until June 2006, based on a permission limited in time. Since 2012, research is revitalized within an industrial project. The engine was constructed and built by Felix Scharstein, Send's partner in the company ANIPROP GbR until 2013 (see about us). The nominal power is 1kW. The left picture shows the HFG3 at night, almost idling to comfort its neighbours. For more pictures and videos, please visit ANIPROP HFG3 . Patent Nr. 101 09 475, IPC F03B 13/00 (2006.1), by Deutsches Patent- und Markenamt 7.01.2010 (claimed 28.02.2001). Beginning in 2011 right after SmartBird's first presentation, a new concept of the stroke-wing engine with dual wings has been investigated, which is designed for extracting energy from an air current. The outcome of the research project within the frame of the Festo Company's Bionic Learning Network was presented in April 2014 at the annual international industry fair "Hannovermesse". The technology demonstrator DualWingGenerator consists of four wings to the left and to the right of a central hub.